Fleetwood Town head coach John Sheridan has warned his successor Joey Barton that management isn’t easy but striker Jon Parkin believes the ex-Burnley and Manchester City star couldn’t have a better club to start his coaching career. Fleetwood announced yesterday that Sheridan will leave Highbury when his 14-game deal expires in the summer and Barton will take over on June 2, upon completing his ban from football imposed last April for breach of FA betting rules. Barton penned a three-year deal after rumours of his impending arrival had swirled around Highbury. The 35-year-old visited Town’s Poolfoot Farm training complex this season, was spotted at matches and is a friend of chairman Andy Pilley, with whom Barton attended a match at Chorley FC the night before his appointment. Sheridan was asked about the Barton rumours last month and replied: “Joey Barton has never managed, has he? I like listening to him on the radio but he has never managed. It is a difficult job. Pilley first brought Barton to Fleetwood in 2012, when he trained with the then League Two outfit, who could not agree a loan deal with his club QPR. Parkin played at Highbury under Micky Mellon and Graham Alexander, two young bosses who, like Barton, were given their first managerial job by Town chairman Pilley. Parkin, back in Fleetwood this week as a coffin-bearer at club vice-president Ted Lowery’s funeral, said of the appointment : “We will have to wait and see. You never know until the season gets going. “But he has gone to a very good football club, a very well run football club where the chairman will do anything to help. As a manager it cannot get much better than to start somewhere like that. “But you never know. There are some fantastic players who have gone into management and not done well – look at Gianfranco Zola. “Then there are managers who have done well who have not been great players, so being a good player does not always mean success in management. And Parkin said he would welcome a crack at management himself. With Barton ineligible to represent his new club in any official capacity until June. Town needed FA permission before releasing a brief statement from the next boss on their website. 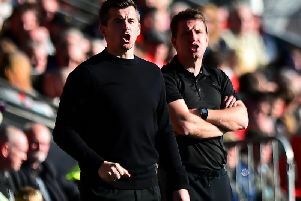 Barton said: “I’m very excited by the challenge and the project at Fleetwood Town. It’s a club I’ve known for a long time, and a chairman I already have a very good relationship with.